Not even the IMF believes the Greek bailout deal could work. The International Monetary Fund clashed with Greece's eurozone creditors Tuesday, saying Greece needs a monumental debt relief. "Greece's debt can now only be made sustainable through debt relief measures that go far beyond what Europe has been willing to consider so far," the fund said in a new report. The IMF said Europe's choices are limited if Greece is to remain in the eurozone and return to international money markets. It said European countries would have to either "very dramatically" extend the grace periods on Greece debt, or concede to "deep upfront haircuts." The fund then went even further and said Europe might be forced to just hand Greece some cash, suggesting "explicit annual transfers to the Greek budget." The report puts extra pressure on other eurozone leaders. They have so far rejected the idea of debt forgiveness and transfers to Greece, trying to protect their own taxpayers from pouring more money in to the country. The most they seem to be willing to consider is some form of debt restructuring. And while the IMF encouraged Europe to consider debt relief, it gave no hint it would consider doing the same with its own portion of Greece's 312 billion euros ($343 billion) debt. 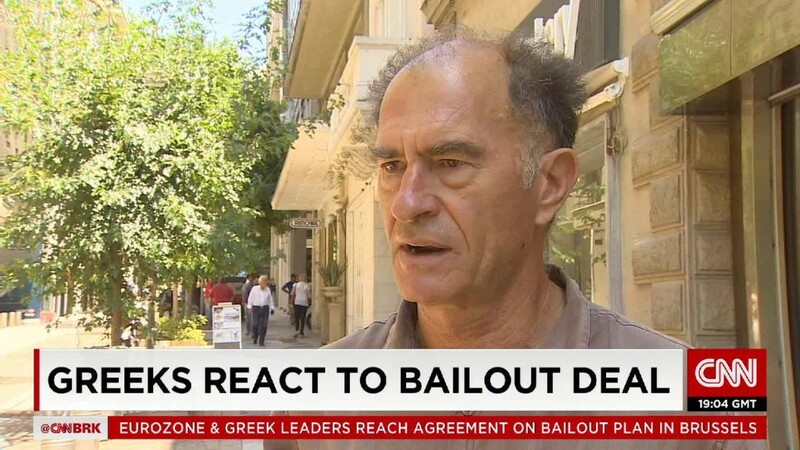 The fund warned that it may not be able to participate int the new $96 billion bailout deal agreed Monday, unless Greece's finances are brought under control. Greece will need 85 billion euros ($93 billion) by 2018, the IMF said. The country's debt is set to reach 200% of GDP in the next two years, compared to the current level of 177%. The IMF blames the Greek government for the situation. The radical left-wing government backtracked on number of economic reforms. On top of that, the turmoil of the last two weeks -- which led to bank closures and capital controls -- have sunk Greece's finances even further.